The holidays are fast approaching, and with marketing news sitting at its highest quality, the inbound marketing articles are better than ever! 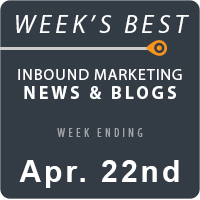 Here are some of the big highlights from this past week: ‘Popular Pins’ are now available for embedding on brand websites, JPMorgan’s Twitter Q&A demonstrates the power of online reputation, and conversion counts are noted in Facebook Ads Manager. There is all this news and more happening across the web as we speak! Have you been in dire need of SEO advice from some of the top experts? We’ve got an extra special blog post for you from the folks at Google! This 14-minute video by Maile Ohye takes you through the steps to create a sound SEO strategy with Webmaster Tools. It’s no question that the Google Hummingbird update has forever changed the landscape. In this Twitter-based 2014 survey, The iMarketing Cafe asks experts for their opinions on how this change will affect SEO from now and into the future. Marketers are always looking for new ways to build backlinks and value to their websites. Luckily, you can utilize huge collections of free SEO tools for maximum effectiveness. Venchito Tampon creates a list of 30 such tools to help build your links. World-class SEO knowledge is difficult to come by. With endless self-proclaimed “experts” swarming the web, it can be challenging to discern value from noise. Sanket Patel interviews entrepreneur Neil Patel, founder of KISSmetrics, to talk about the search engine landscape. Millions of people use Facebook everyday. At this point, privacy and security are considered afterthoughts, even though they are the most important aspects of our lives in an online world. Naomi Paton shares an interesting Facebook infographic and how it affects you. Are you tired of an endless stream of jumbled content pouring down your Twitter stream? Twitter has enabled a new feature to its tweet-scheduling platform, TweetDeck. Single Grain properly introduces Custom Timelines in this eloquent post. If you think your Facebook page can’t convert, we want you to read this real-life example. Carrie Morgan writes up a case study for the Three Dog Bakery. Enjoy the smart read! While we want everything to go smoothly, some instances won’t feed that fallacy. This is true more than half of the time. Frank Reed informs us on the latest developments with LivingSocial’s site error. Putting the time in to reach a local audience takes a lot out of a business. Thankfully, only a few simple tweaks are necessary to narrow down your focus to the local market. Dale Allen Steinke puts down four strategies to reach out locally. Optimizing your Google Plus Local page shouldn’t take too much out of your day, granted you know exactly what to do. If local marketing is going over your head, do not fear! Vee Popat publishes a good read on boosting search optimization for your Google+ Local setup right on his blog. How did your email campaign perform last week? Either way, email marketers can stand up and test out alternatives until they get the right mix of marketing and messaging. Jason Delodovici highlights eight tips to benefit your email drip. We are about to reveal the ultimate secret to messaging anyone on LinkedIn. Ben Lang completed his homework and found the solution! Click through to learn his successful method. As an affiliate, the name of the game is email and sales. Knowing this, it is necessary to delve beneath the content to the particular fashion in which that information is presented. Erica Barnes shows us part three in 44 days of a successful affiliate. Mobile design is an extremely intricate art, which is why asking expert-level designers who they view in this expanding field is eye opening. What do they value when designing, and how can you apply this to your business? Tomas Laurinavicius posts the thoughts of 13 mobile designers for you to absorb. People use their phones as they shop for a variety of reasons. Ayaz Nanji narrows down exactly how consumers use their phones from within retail stories. Two thumbs up for the stunning graphical display in this post! Believe it or not, millenials have a massive impact on the smartphone market. What insights can we gather from observing their habits and interactions on mobile? Chantal Tode provides the complete story on the subject. Writing compelling content from scratch is no easy feat. It is imperative to build out your ideas so that they can become relatable articles your audience will absorb. Allie Kelly gives out five to-dos to crafting content. It seems that infographics are everywhere these days (see if you can spot the infographics in this roundup). Nonetheless, there is a difference between helpful visual data and downright irrelevant. Joe Shervell publishes a detailed post on creating great infographics. Obtaining a large amount of subscribers in an extraordinarily short length of time is doable. Content marketers only need to be a little more skillful in their strategy to boost their audience. Gregory Ciotti demonstrates attaining 30,000 newsletter subscribers in 12 months. When we say interviews are useful, believe it! Gathering the advice of a few high-quality content marketers is more than generous, let alone 20 marketers. Regardless, Buzzsumo wonderfully asks them to share their suggestions on solving content marketing pain points. No matter how you look at the situation, the Healthcare.gov website needs fixing. This is where ConversionMax comes in. In a strong review, Theresa Baiocco breaks down the site and reviews what it can improve on. Another interview roundup here with valuable commentary from industry experts in conversion rate optimization. If you are a retailer, you won’t want to miss this! Nii A. Ahene asks 11 CRO leaders to provide advice. Sometimes, reputations can be damaging, especially online (where almost nothing gets erased). However, one company promises to delete results that injure a company’s reputation. Find out the full story by Leo Mirani. What steps can you take to protect your digital persona? Which are the most crucial factors in online reputation? You will learn that and more in this combination blog plus infographic by Amalia Otet. The list above includes some of the most interesting articles we caught in our streams this week. 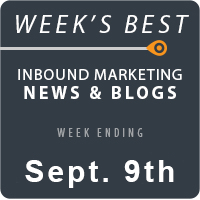 If you want to share any other great inbound marketing news, let us know below in the comments!